Yemeni people are not bad people, they are good people. They want to be respected, they want their sovereignty to be respected. We did not wage a war, a war was brought upon us. Our issue was an internal one and it would have been sorted out internally. Hanan al-Harazi, her mother and her 8 year old daughter fled Yemen 10 days after the first bombs started to tear holes in her beloved country. Hanan’s daughter had begun to present the early signs of PTSD and for her sanity, the family decided to split itself down the middle, leaving Hanan’s husband behind in Yemen with his family and her two brothers. Hanan brings us a moving and powerful insight into the events leading up to the present devastation of Yemen at the hands of their Saudi oppressors and their imperialist allies. Vanessa Beeley: When did you leave Yemen? Hanan al-Harazi: I think we were in Yemen for almost 10 days after the bombing started and then there was a rocket attack on our immediate neighbourhood, very close to where we lived. After this, my daughter developed urinary incontinence and a sudden fear of any loud sound. Recently, I was looking for her for over an hour and I eventually found her hiding in the closet because she had heard an aircraft flying overhead. It will take decades to erase this trauma from her memory. I can’t even imagine what the other children still in Yemen have been going through after almost 103 days of continuous air raids. It is devastating. VB: How old is your daughter? Hal-H: She is turning 9 in August. I used to work at a school so I know that children are not able to express themselves in words as well as adults. I just gave her a piece of paper and I told her to write down her feelings. It was heart-breaking for me to read the pain and suffering in those baby words. 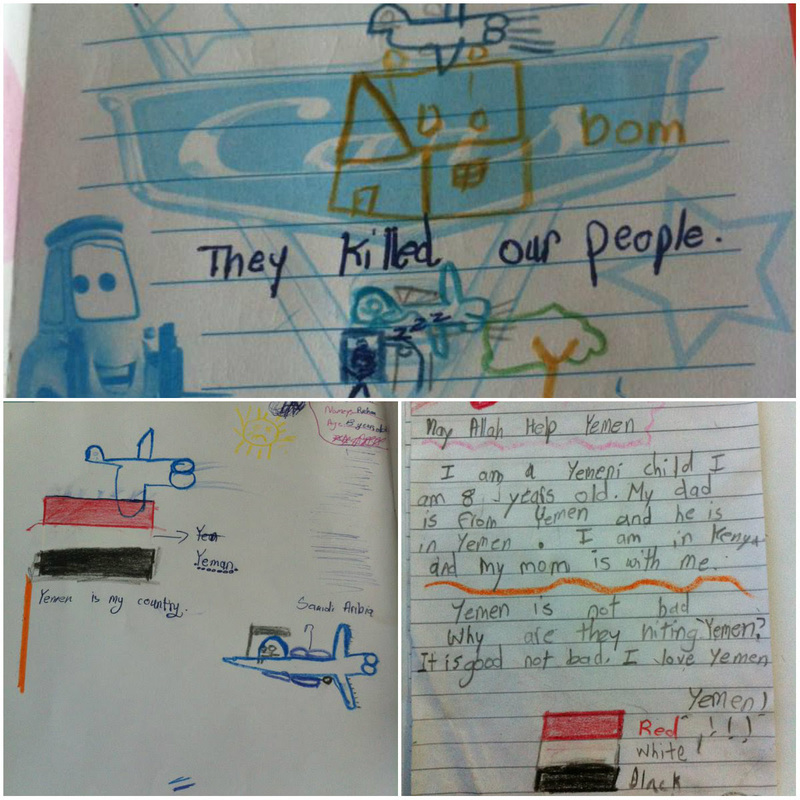 A few days later, it’s the same thing, all she can draw or paint are jets bombing her country, really sad images. I know that the sun represents something really positive in a child’s life but when you have a child depicting a crying sun with a sad face, it should really pass a powerful message to the world. We were lucky enough to have foreign passports that meant we could leave Yemen. Nobody is issuing visas to Yemeni nationals so this means 23 million people trapped inside a country that is being mercilessly and indiscriminately bombed with complete disregard for civilian life. VB: There are reports that state over 80% of the population are now enduring a humanitarian crisis. Is this figure realistic? Hal-H: Absolutely! There is a catastrophic humanitarian crisis unfolding in Yemen. My fear is that if the blockade is not lifted, we are going to witness something horrific by all standards. You are talking about a population of which almost 60% are living below the poverty line. They don’t know how to secure the next meal and this was when their world was “ok” and not in a state of war. I would say the few people who had jobs have lost them and food prices have rocketed. The capital may have slightly better facilities than some outlying areas but even there, the water is now contaminated and the cost of bottled water has trebled in price. I have no idea how people are coping. Food is still available in the markets but supplies are sparse. Once these supplies do run out, Yemen will starve. We produce very little food in Yemen itself, the majority of foodstuff is imported so the movement of goods is essential to our survival. The blockade will ensure that we cannot survive. There has been a tiny trickle of aid via certain aid groups and NGOs but this has only reached hardest hit areas like Aden, leaving entire swaths of the country without food, water or medical facilities. The cumulative effects will be horrendous and the Humanitarian crisis will be crippling. VB: I am assuming that KSA [as Israel did in Gaza] is targeting Yemen’s infrastructure in order to destroy the civilian ability to survive this onslaught. Hal-H: Yes, absolutely. If you look back to yesterday, the events in Amran and Lahj, they have targeted food markets and livestock markets. More evidence of the coalition determination to starve the people of Yemen. The livestock constitutes part of our minimal domestic produce, so this is a deliberate destruction of the civilian ability to survive. The footage that is coming out shows that they are targeting civilian areas, schools have been hit, stadiums, sports facilities, you name it. They have hit everything. They are saying they are only targeting military centres. Perhaps in the beginning this was true. Over the last few weeks we have seen far more random and intense bombing of civilian sites. The Ansarullah movement is pretty much part of the Yemeni fabric, the Yemeni society. 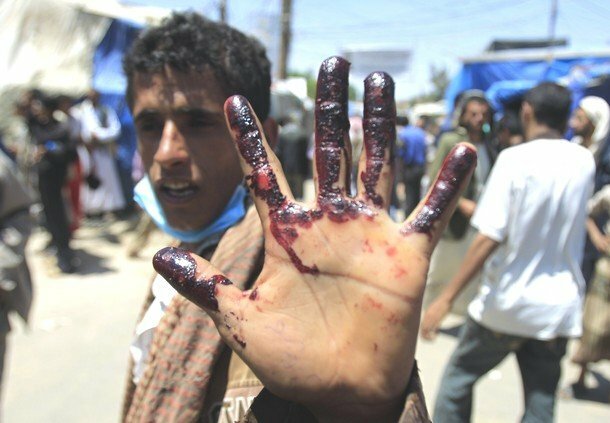 They don’t carry any markings or insignia to distinguish them from the local population so it is beyond ridiculous to say that they are hitting only Ansarullah targets in a city like Sanaa, that has a population of 3 million people .The civilian death toll is way higher than if they were only targeting Ansarullah operatives. VB: In your view is there any alternative to resisting this attack on Yemen? Is there an option for surrender and negotiation? Hal-H: Look, I will speak for myself and for a lot of people in Yemen. The question of Yemen’s sovereignty has always been uppermost in Yemeni minds and this led to the 2011 revolution to get rid of our long-time dictator Ali Abdullah Saleh because we knew he was largely a Saudi puppet. He was pushing the Saudi agenda in Yemen and giving it priority over the interests of the country. During this time many people lost their livelihoods and their lives and most of the major cities caught up in the revolt, came to a standstill for a while. We have not come this far only to have another Saudi puppet government in place in Yemen. If this continues, we no longer have an identity. Yemeni people are not bad people, they are good people. They want to be respected, they want their sovereignty to be respected. We did not wage a war, a war was brought upon us. Our issue was an internal one and it would have been sorted out internally. Jamal Benomar, the former UN peace envoy to Yemen, stated very openly that the warring factions were actually reaching an agreement before the first bomb hit. “When this campaign started, one thing that was significant but went unnoticed is that the Yemenis were close to a deal that would institute power-sharing with all sides, including the Houthis,” said Mr. Benomar, a Moroccan diplomat. Thus it becomes obvious that our aspirations are being sacrificed at the altar of Imperialist greed and ambition. VB: We are seeing this across the region, these internal attempts at reconciliation and agreement that are being derailed by the Imperialist agenda and their sectarian propaganda. From what you are saying, this is also happening in Yemen? Hah-H: I can categorically state, there is no sectarian conflict in Yemen. They have been trying to ignite a sectarian war in Yemen but Yemen is one country where we have had Shafi Sunnis and Zaydi Shias praying in the same mosques for hundreds of years. We are a society that is known to intermarry between these two sects. In reality they instigated this territorial war when they wanted to split Yemen into a 6 federal state system. We are tired of having their agenda imposed upon us and being forced to implement it. I have lived in Yemen for the last 21 years and I never knew that my next door neighbour was a Shafi Sunni or a Zaydi Shia. It was not part of our culture, we never asked. We peacefully coexisted. This balkanisation agenda was the start of the entire problem. Their division was all wrong. They left some areas totally isolated. The Ansarullah movement and the Southern Separatist movement were both in favour of a confederal state system where Yemen would be divided into north and south existing within a federal state. Most of us were ok with that. President Hadi [although I hate to call him our President] was pushing the Saudi agenda of the 6 state system. Another thing that a lot of people don’t realise, is that when they divided the 6 state system they purposefully isolated one state called Azal. Azal incorporated many of the Zaydi strongholds, Sadaa, Amran, Sanaa and Dhamar. Azal was left without any resources or any access to the sea. It was blatant imprisonment and suppression of what we would term the “traditional powers” in that area. It was a deliberate attempt to weaken their influence in Yemen. So Hadi’s plan would have divided Yemen into smaller sectarian states while the Ansarullah plan was more like going back to the boundaries before unity where the south would have greater autonomy over its own internal affairs. VB: How great is the “extremist” threat in Yemen? Hal-H: Let me give you an example. The al-Jauf area has both Sunni and Shia populations and so does Marib and elsewhere. The Zaydi Shias and Shafi Sunnis are both very moderate sects. Yemeni people have no affiliation to the Wahabi sect of Saudi Arabia. Wahabism is alien to Yemen. We do see certain areas in the South, like Hadramaut, which has been in the media lately, parts of which are totally under control of Al Qaeda. The funny thing is, the bombs are falling on the very people that are fighting these extremists. Not a single bomb has been dropped on the extremist strongholds. Even though they know that AQ is in total control of al-Mukalla in Hadramaut and the seaport in that area. That has to be a huge question mark over their true agenda in the region. The bombing has only achieved one thing and that is to further strengthen these extremist groups in Yemen. I know that in Ansarullah controlled-areas we have the local popular committees that are in charge of security and they have been working round the clock to ensure that the extremist elements are kept at bay. On the battleground their progress has been immensely impeded thanks to the airstrikes that serve as cover for the advancing extremists. I am not sure if there are any foreign fighters at the moment. I know there are some Saudis, but I am not aware of foreigners from Afghanistan, Chechnya, for example. If things escalate I believe we will see many more of these extremists entering Yemen via our borders, yes. Right now the northern borders are secure, apart from Marib where there is heavy fighting going on. VB: How much support are you receiving from Iran? Hal-H: I do not believe that Iran is playing any active role. They support Yemen from a media perspective only. I believe Iran’s “support” is a propaganda ploy to justify hitting Yemen. This war was planned a long time ago, even before Ansarullah moved towards the capital. It becomes very suspicious when you have a president in power and a minority group leaves its stronghold in the northernmost tip of Yemen and moves down towards the capital, Sanaa, in the centre of the country. One city after another in the north falls to them and the president says nothing. Then just as they reach agreement which was the Peace and Partnership Initiative, Hadi suddenly decides that he does not want Ansarullah to have even marginal representation in Government. That was obviously never going to be acceptable, Ansarullah is a force on the ground that must be considered part of the coalition. That is where the conflict originated and that is why they placed Hadi under house arrest because he was following Saudi instructions. Saudi was against the Ansarullah inclusion in Yemen’s government. Then Hadi fled to the south. My personal take was that the plan was always for Hadi to flee to the south and ask the Saudis for help which justified their bombing of the north of Yemen which has traditionally been the Zaydi stronghold and a thorn in their side. Ansarullah and the army discovered this plan and moved very quickly down to the south and hence you see this widespread bombing in all areas, not just in the north. As a final point in the analysis of Iran’s role in Yemen. Yemen is a sovereign state and we are free to have bilateral ties with whomsoever we choose. Saudi had a problem with Yemen opening up about 12 flights per week to Iran mainly for bilateral reasons because the rest of the world shut down against Yemen. We have been under Saudi influence for, at least, the last 30 years. Many will say it’s much longer due to Saudi having been implicated in the assassination of President Ibrahim Al Hamdi who was probably the best President that Yemen has ever had. Yemen’s greatest problems are economic in nature. Saudi never did anything to resolve our economic issues other than putting our leaders on their payroll in order to effectively destroy the country. It’s nearly impossible for a Yemeni to get a visa to travel, even to the UAE. How can a country flourish when there are so many restrictions upon its people? When Ansarullah came to power our options were reviewed and bilateral ties with Iran were naturally investigated. VB: There is a very strong sense of Yemen’s isolation. Even last night 180 Yemeni civilians were massacred in Amran and Lahj yet the media barely mentions it. Is this how you perceive it? Hal-H: Yes. This goes back to decades and decades of isolation. Let me ask this question to the world. The government collapsed in Yemen in September 2014. Can you imagine a country that has gone months and months without a government in place, without a police force, without an army, with a population that does carry arms and with crushing poverty, yet the crime rate is less than “first world” countries like America. Why are these people isolated when they have this inestimable respect for human life? They are an example to the world. News trickles out via internet, Yemen Today channel and Ansarullah’s channel, al-Masirah. It pains me that people seem to be largely ignoring our suffering, particularly when it is relatively easy to inform themselves these days. For instance, Yemen has had no coverage regarding the internationally banned weaponry that is being used against us. I know that where I work, the area has been decimated. It is an area called Faj Attan a densely populated civilian area where there are shopping areas, thousands of residential homes, schools. How can you use such weapons of mass destruction in an area like this and be exempt from investigation? VB: Are you receiving any help through Oman? Hal-H: Oman appears to have taken a neutral stance, for which I am grateful. The interesting thing is, about a month before the bombing started, I read a report from inside Omanstating that they were preparing for a refugee crisis. They were talking about the possibility of setting up refugee camps on the Yemen/Oman borders. So when the first bombs hit at 1.30 am when we were all asleep, I knew immediately that this had all been pre-planned. Maybe because Oman are (sic) part of the Gulf Cooperative [GCC] they had information that something was being prepared against Yemen. I do know that a lot of people have been flown into Oman for treatment, particularly during the suicide bomb attacks on the mosques in Yemen. VB: How is the internet in Yemen? How much electricity or alternative power source is available? Hal-H: People are struggling, there is no power. Can you imagine a country in the 21st century without any power at all? Many people don’t realise that much of the water used in Yemen is pumped from underground reservoirs and so we need diesel or electricity to enable this pumping process, neither of which are available. From what I hear, electricity is available maybe 40 minutes per week in the capital, Sanaa. There are other areas in the country that have no power at all. We did have this black out problem even before the war but never to this extent. Yes, some have generators but black market fuel prices are crippling. VB: You mention WMD. I know there were reports on the use of nuclear bombs. The information coming out of Yemen is sketchy. Do you have any further information or evidence of this claim? Hal-H: I know that 2 of the bombs that were used did produce a nuclear “type” mushroom cloud. Obviously the effects of any radiation will only be seen after time. But even if they did not use nuclear missiles..the weapons they are using are still illegal and devastating. Their use of cluster bombs is well documented, some have failed to detonate and have been photographed on the ground. They have used neutron bombs which generate so much pressure. When my neighbourhood came under attack in first 10 days, the pressure I felt from a relatively distant explosion was terrifying. I had pain in my ears from the pressure draft for weeks afterwards. The Yemenis were leading normal lives before being suddenly flung into a war zone, its bewildering for everyone. My husband is part of a food distribution network for the poor during Ramadan. He had just gone to deliver some goods to someone in the neighbourhood. Two minutes after he left there were direct rocket hits on this area and this poor man who didn’t even know where his next meal was coming from, was killed. How many more people must die senselessly to serve an Imperialist agenda? VB: Do you have a personal concept of what that Imperialist agenda is? Hal-H: I do not think it is related to Iran despite the propaganda to the contrary. I think we are paying dearly for trying to free ourselves from Saudi slavery. We are paying for our freedom with our lives. I have been told there are oil and more importantly, gas reserves in al-Jawf which is bordering Saudi Arabia and has been protected by them for years. In 2011 when the people took to the streets demanding a better life, President Saleh was forced to admit its existence publicly for the first time. So we are cursed, we are cursed because we have oil and gas. Every country that has natural resources is cursed and a target of Imperialist intervention. Saudi Arabia has fostered corruption in Yemen for decades. Ansarullah were committed to ending this poisonous influence on our leaders and this would have countermanded Saudi power in Yemen. When the first bombs hit, the “sold” tribal sheikhs and politicians were seen fleeing to Saudi Arabia. VB: Would you be able to just elaborate on the situation in Aden and also address why Yemen is so important to Saudi Arabia? Hal-H: Aden is being portrayed by the pro-aggression media as being a battle for the legitimacy of Hadi. In 2011 Hadi was the only viable choice to fill the power vacuum. 6 million northerners voted for him while the south actually boycotted elections. This alone should counter the claims that he has legitimacy in the South of Yemen. In Aden what is happening now is that Hadi has gone back to the South but it has to be made clear that the people of Aden and the surrounding area are not pro Hadi, they are also fighting for their independence and are not pro Saudi aggression. If you look at a map of the Middle East, Saudi Arabia is landlocked. Its only access or lifeline to the outside world is via the Bab-el-Mandeb straits in the south of Yemen and the Straits of Hormuz which are controlled by Iran. Yemen has never attempted to block or to impede movement through the Yemeni controlled Mandeb straits. To be honest I don’t even think that Yemen truly controls this area, it is covertly under the control of the Imperialist nations. Saudi Arabia has a lot of internal turmoil and is brutally crushing its own internal opposition. We would never interfere in Saudi internal affairs but I believe that they fear a strong Yemen. With our new constitution clearly stating that leaders can only have two terms in power, we would be the only republic in the GCC block. In Saudi Arabia, which is a despotic regime, our evolution could threaten the stability of their ruling families. VB: What is the message that you would like to convey to the outside world? Hal-H: My hope right now, apart from a miracle from God, is that there are more good people than bad people in this world and I wish we could reach out to them and tell them, today it is me, tomorrow it is you. We just want to survive, we want to live. Yemen is not the country it is being portrayed to be. We are not terrorists. We are proud of our culture. We are a peace loving people. Yemen is one of the most beautiful and diverse countries in the world. We are being portrayed as savages by a media that is supporting the savaging of our land. I also have to say I respect Ansarullah for their wisdom and self-restraint especially when our mosques came under attack. Mosques that may have been built by Zaydi but are inclusive of all sects for worship. Ansarullah released a statement instructing people not to be drawn into the foreign conspiracy to ignite sectarian divisions. I feel they genuinely represent millions of Yemeni who are fighting for self-determination and recognition as a sovereign nation. Surrender is not an option while our own internal peace process is being derailed by external aggression. Saudi Arabia has failed to send in ground troops and they are attempting to bomb us into submission. They see that this will not succeed so they have now imposed this brutal, horrific, cruel, vicious blockade on Yemen in the hope that the Yemeni people will turn against those who are fighting the Saudi invaders. I am proud of the solidarity that my people have shown to one another. Even in a situation like this where they have so few resources they will still take care of their neighbours. We are human beings and we have a right to a decent life. Yemen is far from perfect but no country in this world is perfect. We did not wage this war, we did not provoke this war. For the first 40 days of the Saudi offensive, Yemen did not fire one bullet towards Saudi Arabia. It is rank hypocrisy from Saudi Arabia to label us the aggressor. It has always been the opposite. Saudi Arabia has always been sending its filthy elements into my country and attempting to spread its disgusting Wahabi ideology. Whether Zaydi or Shafi we will never adopt this distorted, twisted, ugly version of Islam. I would go so far as to state that Yemen has potential to be a model for true democracy in the Middle East. There are 25 million people who call Yemen home. We simply ask to be left in Peace. Is that too much to ask? Vanessa Beeley is a photographer, writer, peace activist and volunteer with the Global Campaign to Return to Palestine. She lived in Gaza during Operation Pillar of Defence and again in 2013. In 2014 she established the Gaza Smile Project to raise funds for children in Gaza. She spent her childhood in Egypt with her father, Sir Harold Beeley who was Special Envoy to Cairo during both Suez Crises, confirmed Nasserist and Middle East Advisor to Ernest Bevin. Since 2011, Vanessa has spent most of her time in the Middle East . She was recently invited to be on the steering committee of the Syria Solidarity Movement. Visit her blog thewallwillfall.wordpress.com Read other articles by Vanessa, or visit Vanessa's website.